My memory of David Cronenberg's Videodrome is pretty fuzzy but I seem to recall it had a lot of bizarre organic technology within it. Sequence Break (written and directed by Graham Skipper - Space Clown) as far as I'm concerned is a unofficial sequel to that piece as this feels intensely Cronenbergian in the way it plays out. I'm not really too much into arthouse as I feel it confuses more than anything, yet while this is certainly confusing there was a sense of style to the movie. Playing videogames is my favourite past time and so I really wanted to enjoy the film and was ready to look past any of the small flaws it may have. Oz (Chase Williamson - Beyond the Gates that also co-starred Skipper) is an introverted video arcade repair technician that meets the girl of his dreams; beautiful geek Tess (Fabianne Therese - John Dies at the End) who visited the store he worked at one day. 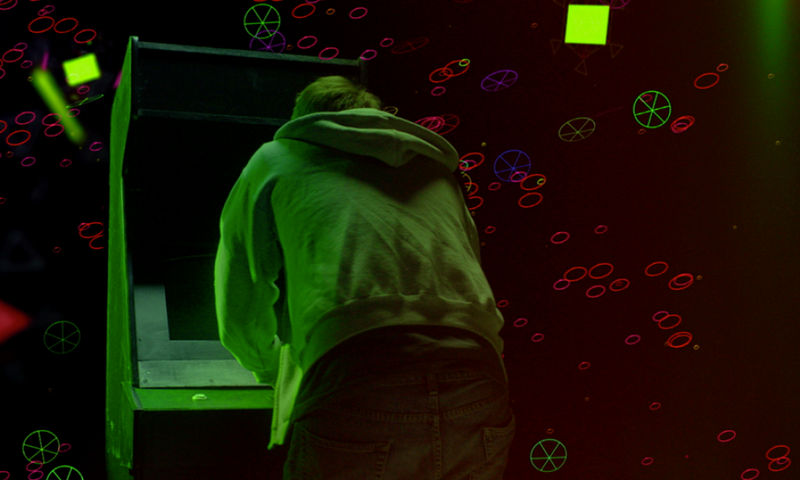 This chance meeting coincides with the mysterious appearance of a new arcade game circuit board, once Oz installs it into a machine he discovers a hypnotic game that causes intense hallucinations and visions that bleed over into his life. The game has some sort of power and soon Oz keeps finding himself compelled to play it and discover the forbidden secrets it hides. However Tess also finds herself drawn to the strange thing, as well as a strange crazy vagrant (John Dinan) who appears, and whose riddles seem to suggest he knows the terrible truth behind the game. This has a small cast with only really two main characters with Oz and Tess. They are both meant to be videogame geeks but this never really came across very well in the dialogue with only a couple of references that felt a bit forced. This wasn't helped by the scenes of them playing games that featured lots of waggling of joysticks and bashing of buttons, sometimes as the two looked up and talked to each other while doing so. Tess was the more likable of the two and that brought me to another issue. Oz is a loner, I get that, I'm one myself, but we never get shown just what sort of person he really is. With him on his own for so much of the run time it was hard to root for him when his actions seem so off and it not obvious if that was the fault of the machine or just how he was. There is one scene for instance when he is quite rude to Tess and I never really understood why. The best looking parts of Sequence Break are when Oz is playing the weird game he discovered. There are nice arthouse style shots of discordant screaming faces mixed in with the gameplay and at one point a quite fantastic looking scene of Oz's skin melting off his face, looked like something from a bad acid trip. The film's final third delves deep into arthouse territory and I admit I started to feel a bit lost with the random, confusing, and seemingly nonsensical events. These feature time travel, alternate dimensions and extreme close-ups that got kind of bewildering. I reckon I just about followed the plot though it was hard going. The notion of a gateway to infinity was a pretty cool concept. These elements that were more outlandish did lead to some novel film making techniques that impressed me. At several points scenes 'break' with a sound of digital clunking followed by characters glitching that reminded me of a game crashing. Also in one cool segment the entire film rewinds itself right back to the beginning in one short sweep. While too much arthouse is usually a bad thing for me certain parts I can get behind. The arcade machine is a delightful entity in that by lighting and sound it took on an ominous feel to it. The machine's transformation scenes were great to look at, the green circuit board became organic and pulsed, while the joystick and buttons turned into a strange sort of white marshmallow substance that melded with Oz's hands giving him some sort of odd sexual gratification. Sequence Break is the best horror film about videogames (about, not based on) I have seen, admittedly it is not a huge sub-genre. While the screen perspective faces of the characters playing occasionally seemed more silly than trippy the sub text that videogames can be addictive and too absorbing came across, while the overall plot was quite hard to follow at times but was enjoyable. Despite Oz not having much character to him I did come to care about Tess, as well as the owner of the arcade Oz works at. It isn't often I really want characters to survive horror films unscathed. While the third act disappeared a little too far into itself I found this to be a mostly good film with some original ideas. 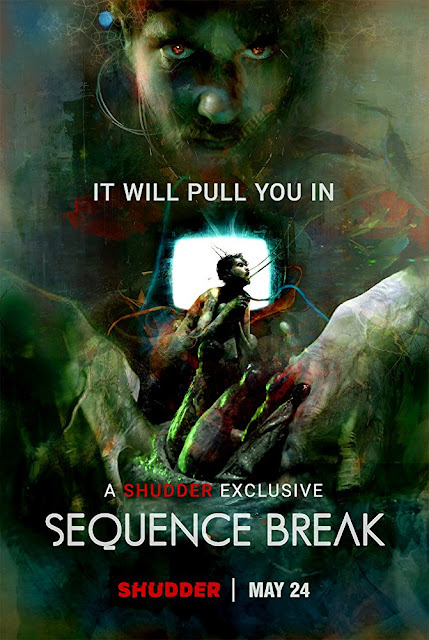 Sequence Break is currently an exclusive on Shudder.